SCardX Easy is an ActiveX control which creates the communication channel between your application and any ISO-7816 smart card via MS Smart Card service and the attached PC/SC compatible smart card reader. What kind of smart cards and the card readers are supported by the SCardX Easy? 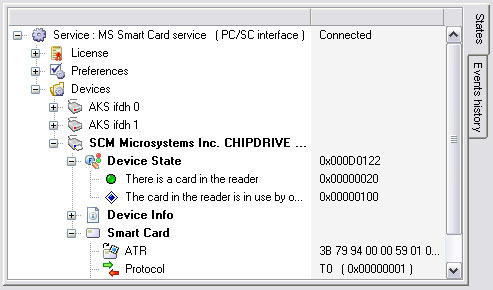 SCardX Easy ActiveX control is based on the MS Smart Card Service which implements the PC/SC Specifications 1.0. It means that you can successfully use any of PC/SC compatible devices like the card readers, USB tokens e.t.c., and you can work with any of ISO-7816 compatible smart cards like the GSM SIM cards, EMV payment cards, identity and cryptographic cards and all other types of processor cards, except memory cards. Where and for what kind of applications the SCardX Easy can be used? SCardX Easy can be used to create any kind of smart card based applications regardless of the programming language and IDE you use. 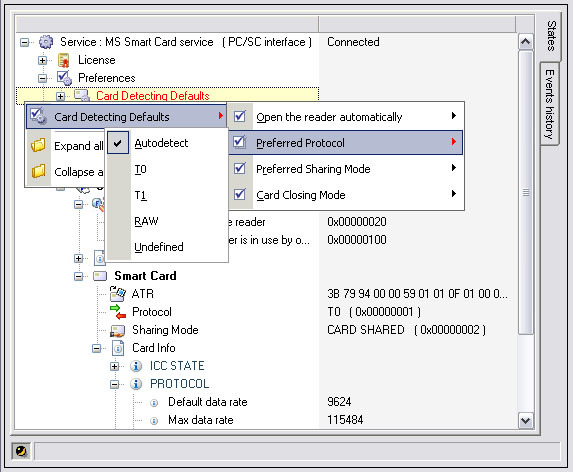 SCardX Easy looks like the Connection Monitor of the program Smart Card ToolSet PRO and allows you to control the connection and devices states and all events occured. 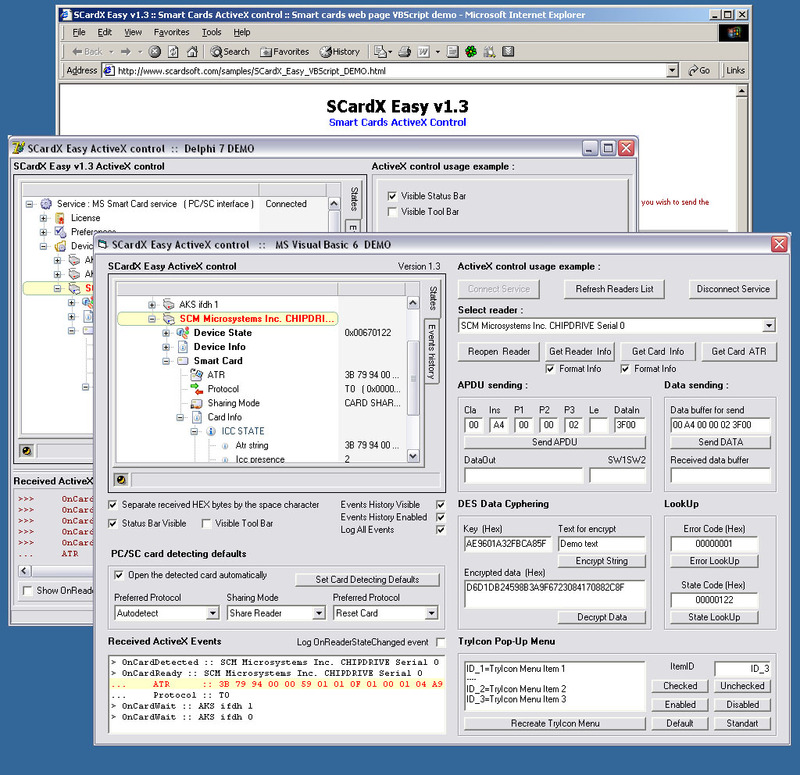 The "States" page is the main user interface element of the SCardX Easy ActiveX control. There are all most useful commands and the most informative elements on this page. This page has the context pop-up menu which allows you to access many useful commands depend on the selected info item. The Events History page contains the archive of all events occured since the application is launched. 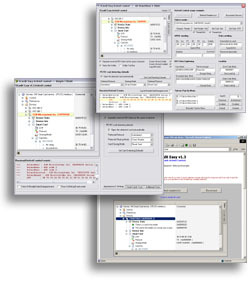 The ToolBar panel contains the APDU sending controls. 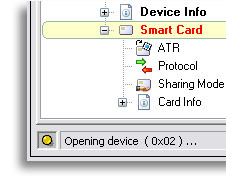 Using the ToolBar you can prepare and send into the opened smart card the command APDUs manually. 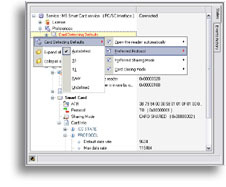 The StatusBar is an indicator of the activity of the data exchange process between the SCardX Easy and smart card service. The SCardX Easy shows the icon in the system tray zone. You can add there your own menu items and to manage the user on-click events. You can hide the tray icon under the Developers License. SCardX Easy adds to your web page the smart cards functionality and allows you to work with any ISO-7816 smart card from the web page easy. Additional helpful resources compatible with the current version. Visual Basic Developers Help system. Smart Cards on the Web Pages. VBScript Web Developers Manual. VBScript Web Developers Help system. 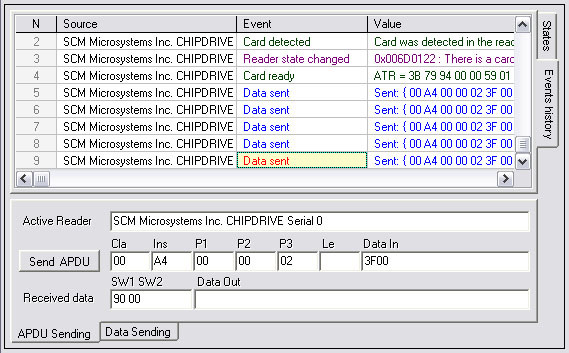 Smart Cards in the Delphi applications. Developers Manual. Smart Cards in the C++ Builder applications. Developers Manual. C++ Builder Developers Help system. The Base Setup Pack installs and registers on your PC the SCardX Easy smart cards ActiveX control, help system and example demo applications with source codes. Make sure that you have full control over your antivirus because some antivirus programs may block the installation and registration of the activex on your computer. Please configure your antivirus program to allow the installation and registration of all components of SCardX Easy activex on your computer! Version 2.0 is the major version upgrade of SCardX Easy which requires the license upgrade. If you are a registered user of SCard SOFT and already have the Registration Certificafe for one of the previous versions - please upgrade your license. SCardX Easy is a shareware. It means that you may install the Base Setup Pack and try how it works before purchasing the License. You can purchase your own Personal License for $26 USD only!